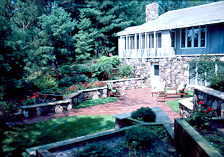 The brick patio shape that you see in this picture was designed by first knowing that the two sets of stairs had to be connected. Also, it had to allow access to the back door of the house. I wanted some grass to add greenery and the color contrast to the red brick patio. 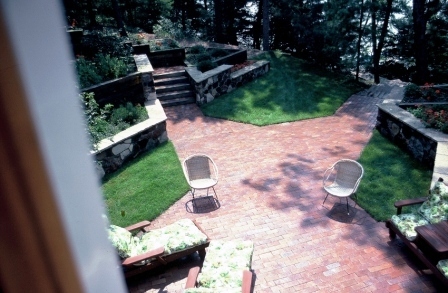 The design had to repeat or extend the lines of the lower stone retaining walls which help to determine the shape of this patio. In this picture, you can see the stone on the lower portion of the house and how it was used to cover the lower retaining walls to extend the home out into the landscape. The eating area of the home on the upper level and the master suite on the lower looks out onto this beautiful backyard. The backyard provides enjoyment for the family and friends both inside and outside the home. This Big Patio allows plenty of space to cook out and have a couple tables for eating or play board games great family fun. 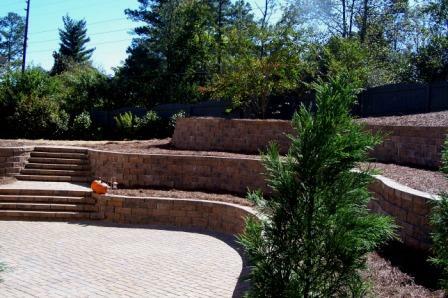 I would like explain little about the process required to determine the design and location of the patio and retaining walls. No one should ever start building anything without a well thought out plan. First a survey must be done by either a qualified landscape designer or a land surveyor. You must know all existing details because those details will give you a clear picture to where the retaining walls will have to be installed to fit the lay of the land on a given site. 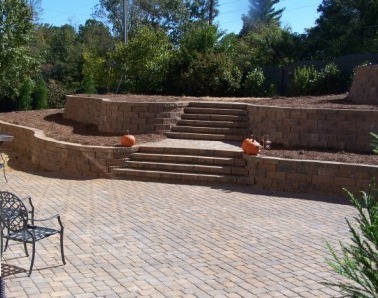 The shape of this patio was dictated by the wall pattern as shown in the pictures above. I designed the above backyard with close contact with the homeowners. 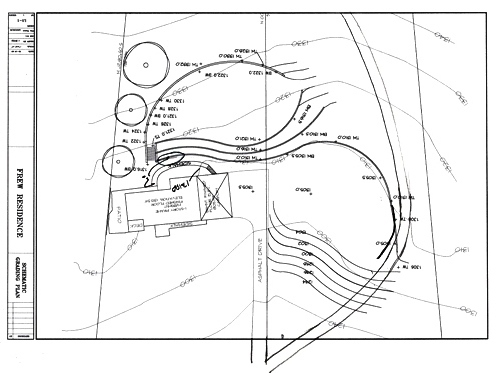 The homeowners first requirement was they wanted a large patio, so that ment the hillside had to be removed further back to allow the their patio wishes with the proper site measurement and survey that it was not a problem to proceed with the design. I believe that the existing conditions of the site should determine the design so the final product looks like it was ment to be and it fits the site like a glove. The Landscape Contractor installing the job made one comment after every thing was completed that the grade elevation were right on. This new home had a small concrete patio. It was a typical builder special and much too small for even a retired couple to enjoy. The homeowner call me adding on the to existing concrete patio. I told him that he had three choices. First, he could add on by extending the concrete to what ever shape that he wanted. He said that he didn't want any more concrete. The couple didn't want to look all concrete. Second, I suggest that flagstone could added on top of the concrete by covering the entire patio. The cost was too much. My third choice was to add the brick as shown in the picture on the left. The couple that own this home has been great friends and a customer for close 20 years. They have lived in four house since their marriage. I have been lucky enough to design all four landscapes and i have contracted on them all. The picture that you see above is the four home. This picture was taken after I had done a complete clean-up in late fall about 2 years after the installation. 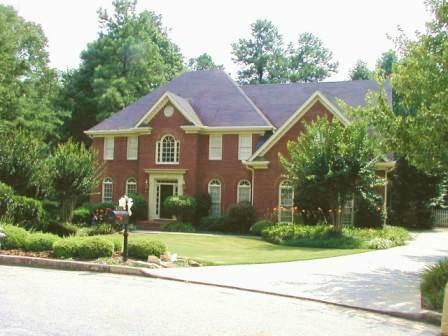 Southern Magazine was scheduled to do a photo shoot both inside and outside the home. The crew arrived and completed the shoot. The Magazine was sold during the photo shoot and the new owners decided not to publish this kind of stories anymore. The picture on the left shows the condition of this property before any work had been done. The first problem was the driveway design at the street. The existing drive entrance off of the street was a small Y. There is a 23 foot change in elevation from the street level to the bottom of the garage door. When you entered the Y at the street driving down the drive, you could not see anything in front of the car. It was like you driving into space. You had no idea where the driveway was at all. The solution was to remove the stupid Y so when you entered the drive you would be looking right down the drive at the front of the house. The second big problem was the water flow down the drive and the adjacent properties on both sides ended up at the garage door. A portion of the driveway to the left of the garage was removed. 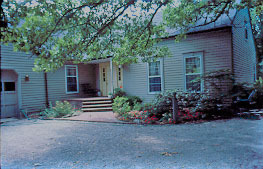 The drive addition was sloped to the left of the house front. A large drain box was constructed with concrete curbing at the end of the drive addition. A big drain pipe was installed down to the back of the property and the problem was solved. The picture of this backyard is the way it looks now. 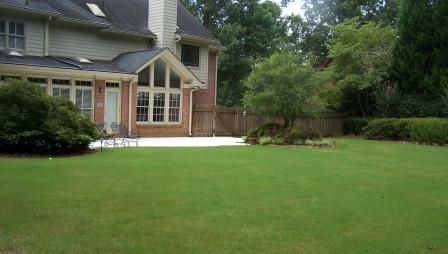 This yard was approximately 4 feet higher at the start of the design. A 4' high railroad tie retaining wall ran across the back of the house . The wall was about 6 feet out from the house with serious drainage issues along the house wall. The yard was totally wooded except for a small grass area near the wall. The client wanted a big grassed backyard for their two boys to play. The design first included removing the trees and lowering the grade. Since there was no place on site to use the dirt, it had to be trucked away. The design also included plantings around the sides and back of the property. It is a great view looking out from inside the home. This home is in Florida on Amelia Island. I had designed two other landscape plans for this couple when they lived in Georgia. They called wanting me fly to Amelia Island to help them locate where the best place would be to build a new home on the lot that they had purchased. 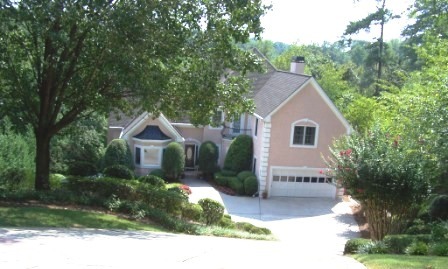 The first plan included where the home would be built, driveway and parking design. The next decision was what building material would cover the exterior of the home. The choice could be many things such as Cedar, Brick, Stone or Stucco. This picture shows a Stucco material called Tabby. It is common to the area. It is Stucco with small sea shells pressed in the stucco. 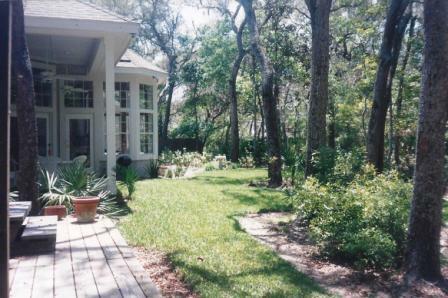 Many existing trees and under brush on the site was removed to build the home. The larger trees on the site that could be left was saved along with trees in the backyard to provide a back drop over the top of the roof to help the frame house. The plantings consisted of many Florida coastal native plants. This homeowner was just finishing this new home when he call about a landscape plan. When I arrived at the home, this is what I saw. 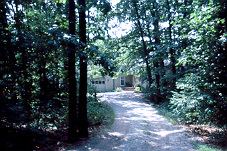 The house was built on a open area of the property with a wooded area to the right of the house. the house and garage was an L shape. The garage faced the wooded area with very little space between the front of the garage and the trees. The typical builder wanted to remove more trees and install the drive straight from the street to the house. I told the client that I would like to see the drive come through the woods. It would have a better approach and feel. As you see, I won the argument because the client thought that was a wonderful idea. The picture on the left show the new drive location. 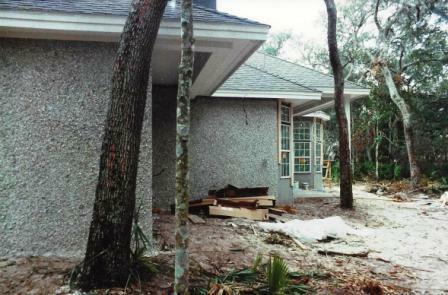 Because of the floor height of the garage, the driveway was installed without excavating the soil and prevent destroying the tree roots in the area. The picture on the right shows the front entrance where the stairs were angled. I designed the stairs so the eye would be directed to the front porch. Also, It allowed a bigger planting between the walk and the house. 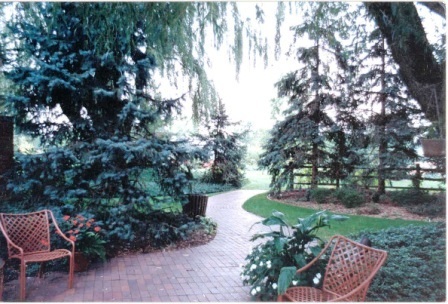 This picture shows a lovely brick patio with a Serpentine Walk leading out to the back open area. This was an easy installation because the under soil was sand. Dig out, compact and lay the bricks. 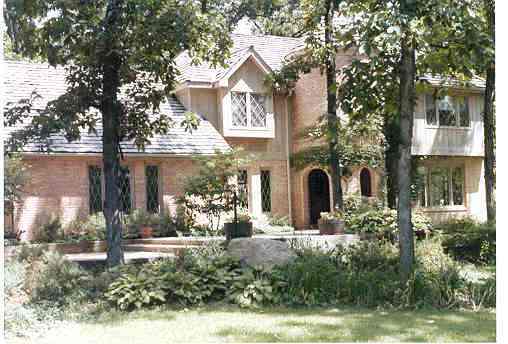 This beautiful home is in St. Charles, Illinois. 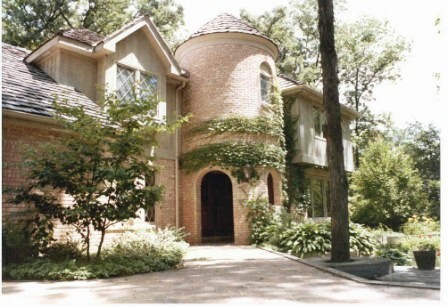 This is a Tutor styled home with a Portico tower entrance. 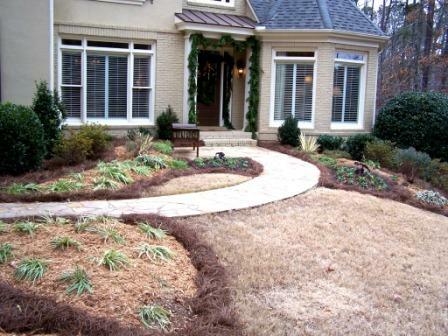 I designed this large brick terrace area to allow plantings next to the home and give an welcoming entrance. The change in site elevation allowed a lower deck with a bench surrounding an existing tree. There are 2 steps from the brick terrace down to a brick parking area. The stairs are 20 ft. long. The are the same width as the parking area. The picture on the left was new home in 1992 with very little landscaping except for a foundation planting installed by the Home Builder. 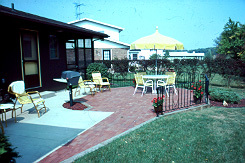 I designed and installed the landscaping in 1992. 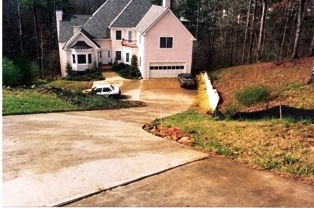 The same house on the right shows what the completed landscape design and installation looked like in 2012. It has been well maintained for 20 years. 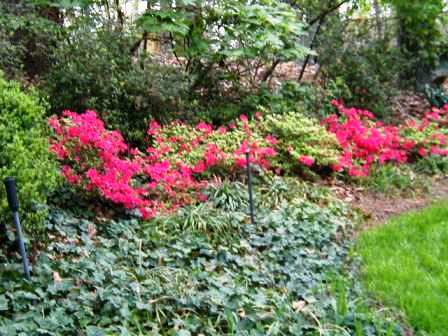 In most cases, Builders don't care what plants are installed by his landscaper. He just wants the plants brought to the job and plant them. For 35 years, I made a living off of removing and relocating the wrong plants for the site location on many jobs. Plants that will reach 10 ft. tall in front of windows that are 2 ft. off of the ground. The house on this large property was built about 40 years ago. The house was located too far back on the property. The land had close to 60 ft. change in elevation which made the property impossible to have any play areas for children or adults. This new homeowner bought this property because of the view out the front windows to a beautiful lake across the street. They didn't think about where their children were going to play. The house backed up to a steep hill. The hill started about 12 ft. out from the house with a 24 ft. change in elevation. The hill needed to be removed and retaining walls installed to provide a large flat area up on top. The picture on the right shows the terraces being formed. Several thousand Cu.Yds. 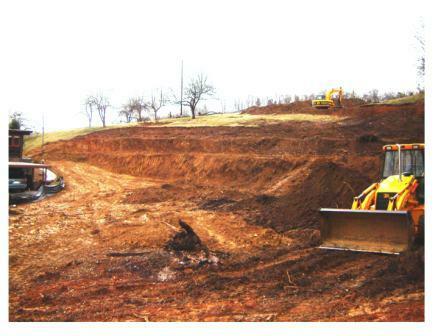 of soil was removed during the excavation. This owner had purchased the large lot next door which was badly needed. 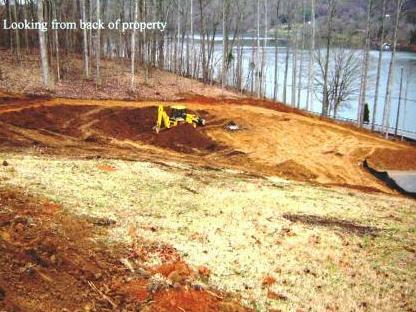 The soil excavated from the back of the house was used to fill a large hole on that property. First, the trees and stumps from this wooded lot had to be removed. 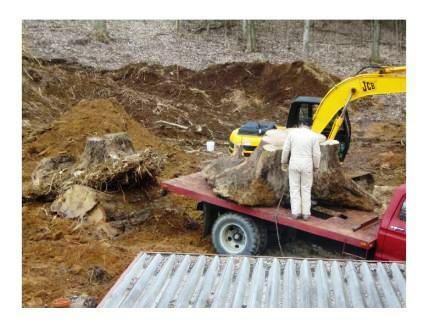 The picture on the left shows size of the stumps and the problems involved in hauling them from the site. The picture on the right shows the area where the hole was that we filled. 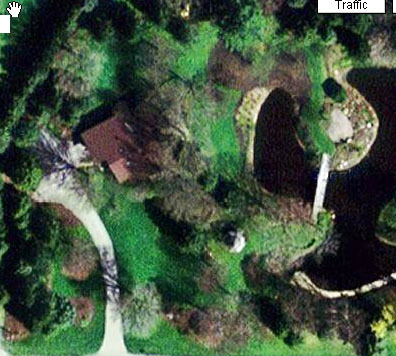 The narrow flat area just above where the backhoe is located in the picture shows new driveway location. It had to be relocated in order to allow access to both the garage and a building at the back of the property. Warning!!!! Home Buyers every where must look at the entire property that they are buying not just the house interior. Existing conditions outside the home can cost you big bucks later as this homeowner learned the hard way. This is a Korean Boxwood Hedge. 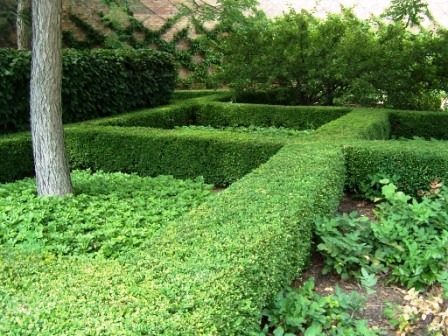 Formal hedges are beautiful but costly to maintain. 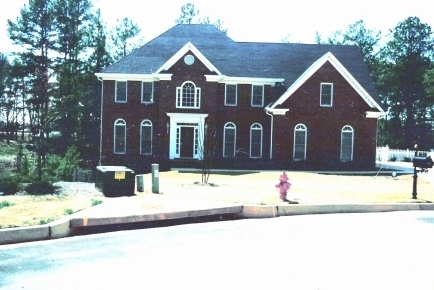 I selected the Home Location on site before construction. Driveway, parking area, walkways and planting design was designed to unify with the existing planting adjacent to the previously designed lake.